Hope is a Girl Selling Fruit is an illustrated account of a young woman’s thoughts and feelings as she comes into contact with the larger world. A semi-auto-biographical tale with art by Mithila artist Amrita Das, and text by Gita Wolf & Susheela Varadarajan (from the Hindi original by Amrita Das), the book was published by Tara Books in April 2014. While a deeply personal account from Amrita’s own life, the book encourages reflections on what it means to make choices, in the face of societal norms. 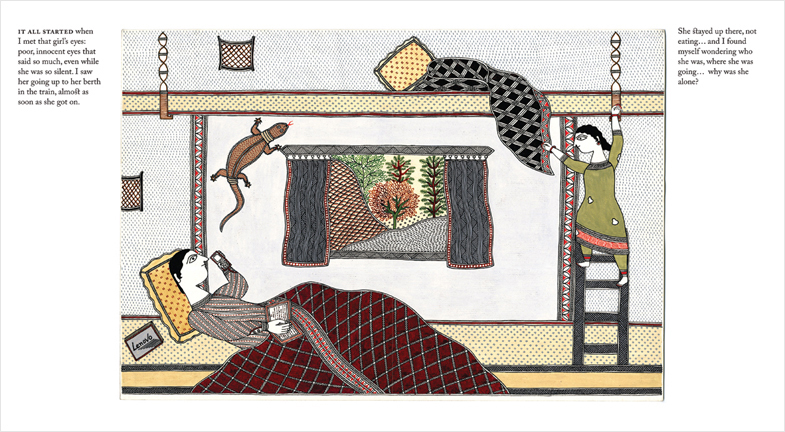 As a publishing effort, Tara Books has been recognised for its sensitive dealing of social and cultural themes through many of its titles, and also successful collaborations between designers and folk artists creating a uniquely Indian style of illustration and visualisation. 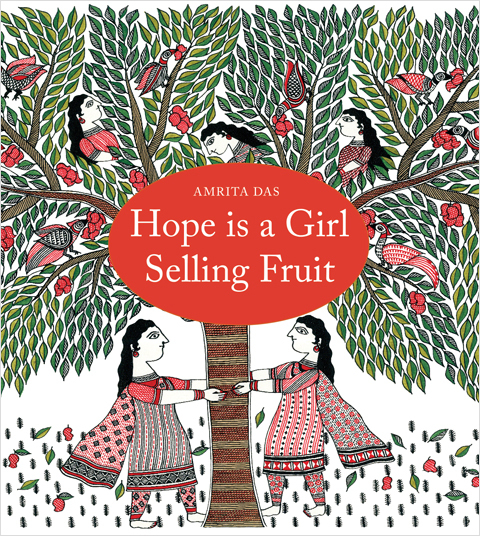 Their recent publication “Hope is a Girl Selling Fruit” is a particular poignant narration, where the choice of the Mithila folk art style adds significant meaning to the story. Mithila painting (also known as Madhubani painting) originates from the Mithila region of Bihar, India and adjoining areas in Nepal. Traditionally practiced by the women within a small community, and initially restricted to religious, mythological themes, the paintings became a canvas for the women to express their feelings and reactions, over time. It is this fact, that makes the choice of art-style an apt vehicle for a story that is about a young girl’s fears, dreams and questions as she ventures out. 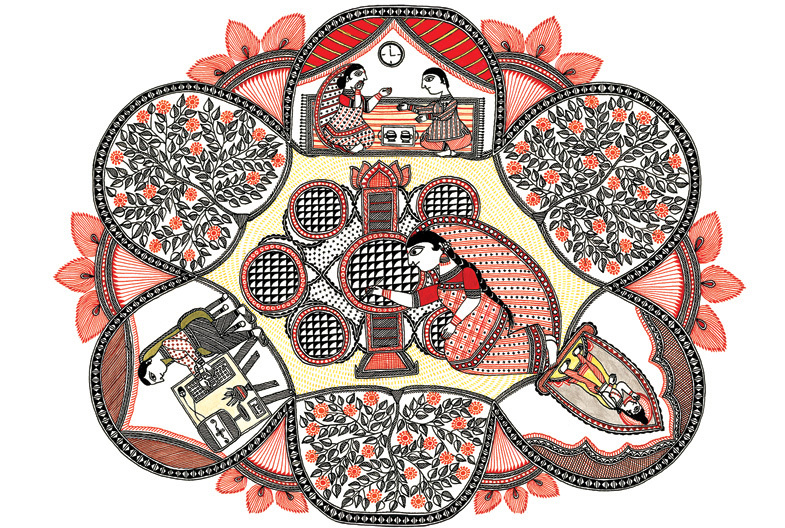 In her art for the book, Amrita uses her training at the Mithila Art Institute, to employ different devices of the style to amplify her narrative. The characteristic detail of Mithila art is used to incorporate elements which establish the contemporary physical situation of the story. Repetitive borders, patterns are used to illustrate situations of limitation and societal norms. Graphic compositions in each page bring multiple events and spaces into a unified moment in time, reflecting the contradictions, questions in the author’s mind. 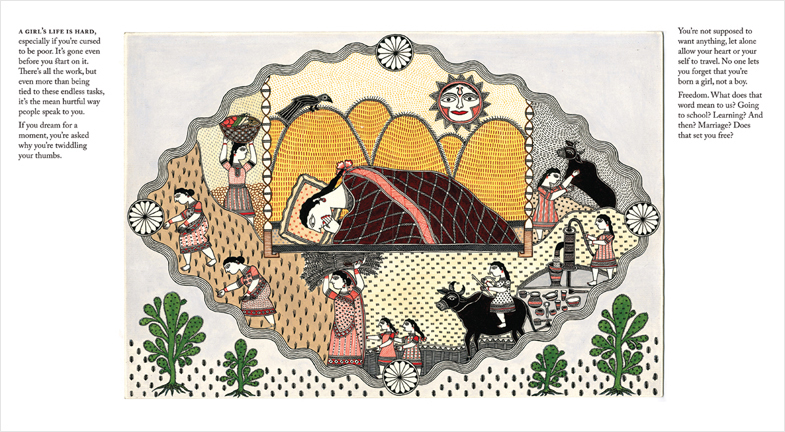 That a traditional or folk art style can be used to establish the ethnic or cultural origin of a story, is but obvious. But the ability to find a resonance with the content of the narrative, and the skill-fullness to reshape established, traditional visual devices, makes work like ‘Hope is a Girl Selling Fruit’ exceptionally rich and relevant for a wider audience. These are some of the places you can buy the book: Tara Books, Amazon. You can also read a detailed report on the book’s art at Look/Book.